The defending champion Jacksonville State is paired with 2018 pre-season poll favorite Eastern Kentucky and Southern Illinois Edwardsville in the opening round. Despite being picked to finish eighth in the same pre-season poll, coach Robbie Wilson’s squad – although one of if not the youngest in the tournament field this week – has played eye-to-eye with the conference favorites all season. In fact, Austin Peay’s tournament lineup of three sophomores — Alex Vegh, Austin Lancaster and Michael Busse, along with freshmen Chase Korte and Garrett Whitfield have a major part in posting four top-three finishes this spring – including a tournament win at the Fort Lauderdale Intercollegiate back on March 5th-6th – where the Govs shot two of their three rounds in the 280’s, including the low round of the tournament to finish one-under as a team. The tournament championship was the first for the Govs since winning the 2014 F&M Bank APSU Intercollegiate, as well as being the first tournament title under Wilson and the first non-home tournament championship since 2013 at the Harmony Preserve Intercollegiate in Melbourne, FL. 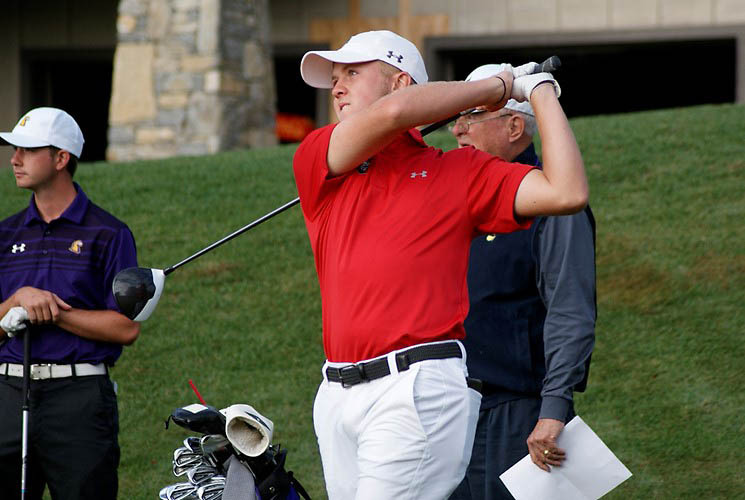 Yet while a young squad, the Govs enter this week’s championship averaging less than two strokes a round more as a team than OVC team scoring leader SIUE — 292.2 to 290.7 — as the fourth-best scoring average this spring, while overall only 5.2 strokes per round separate the top eight teams in the conference this year. Korte will play in the No. 1 slot for the Govs after being Austin Peay’s scoring leader in six of the team’s 11 events this year and averaging 72.8 strokes per round – the fourth-best average in the OVC this season and best among all freshmen in the conference. Vegh and Lancaster — who are the only Govs golfers to have played in an OVC championship tournament before — will go off as the No.2 and No. 3 players for Austin Peay; with the pair having already shot seven rounds in the 60’s this spring overall and averaging less than 74 shots per round overall. Busse will anchor the No. 4 position for Austin Peay, having had three Top-10 finishes in tournaments this spring, while Whitfield rounds out the Govs squad at No. 5, having seemed to peak at the right time with two Top-20 finishes in his last two tournaments, including a two-under par finish just two weeks ago in the Govs final regular-season tournament at the Wofford Intercollegiate. So, while the young Govs squad may not the favorite to win the OVC championship coming into the event they can’t be counted out either and should be in the mix at the end and that’s all you can ask.